Here's what I bought with my December budget! 1. C. Wonder blazer, $90 - The original price on this blazer was $228 so it was a great deal (purchased on sale with an extra 50% off promo going on in store). Still, $90 is a considerable chunk of my monthly budget so I hesitated for a moment. My goal is to buy things I love rather than things that are cheap (you wind up paying less in the long run! ), and this blazer fit the bill. It was love at first site and I've already worn it twice. 2. Gap jeans, $48 - Gap jeans are a personal favorite, they fit me well and this season they have some really great washes, especially this particular pair. They had a 40% off promo in the store, so I was sold. I also tried this patched pair - love the concept, but want to keep looking for a different patched pair. 3. Banana blazer, $17 - I've been drooling over this blazer for months so when it finally went on sale after the holidays I had to have it. The sale price was $67 and I used a $50 Gap credit card reward so I only paid $17. I will have this and love it forever. 4. Gap printed pants, $28 - I bought similar printed pants from H&M a couple years ago and they shrunk in the dryer. I've been craving printed pants ever since, and I used an extra 30% off online code to get them for only $28. 5. Forever 21 dress, $28 - I got this while shopping for holiday dresses and just couldn't let it go. I opted not to wear it for NYE or a recent gala - and at both events there were girls wearing the same dress! They both looked great and my day (and the perfect event) with this dress will come. I'm a big believer in getting the perfect dress when you find it, versus waiting until you have an event looming and in a rush you settle on something you don't really love. 6. Old Navy t-shirt, $3 - I wear graphic tees constantly, especially ones in neutral motifs like this one. Always a good addition to my closet. 7. Old Navy sweater, $25 - I used a 15% off coupon code to order this sweater online. It fits smaller than the other Old Navy graphic sweaters (a bonus). I've been wanting a nautical themed sweater for awhile and I have a couple outfit ideas in mind. 8. Forever 21 plaid, $20 - I bought this shirt a couple months ago in the store. I had an almost identical top from two years ago that needed to be replaced, and it was perfect for several holiday events last month. For more info see: "How to Set a Clothing Budget"
Now comes the fun part - deciding what to buy in January! This time of year is always so strange - the holidays are behind us, but spring seems so far away. I'm thinking a good closet cleanse and focusing on re-wearing what I already own is a good way to start the year! As a result, I don't have a whole lot on my wish list right now. The black peacoat with removable collar above is such a good deal (I have never owned a black coat! 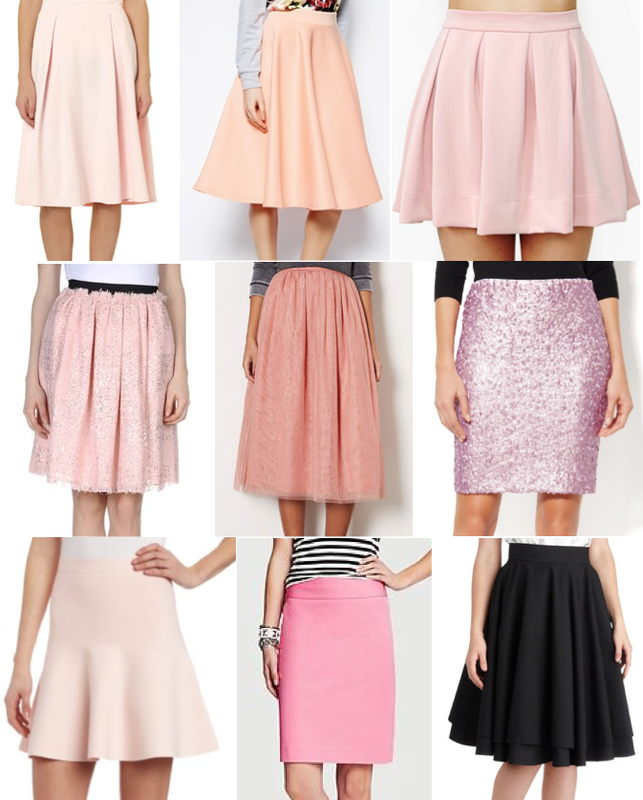 ), and I really want a full blush skirt for Valentine's Day (below). But other than that, I'm stumped. What items are on your wish list - trends, colors, styles? What were your best finds during the holidays? Yoox / Topshop / New York & Co.
Update: I can't believe I forgot to include one of my favorite December purchases - thank you to the reader who reminded me! This gorgeous BCBG dress is $378, and I got it from Bloomingdale's with two coupons for $211. (Links below where you can shop this dress, prices vary.) This purchase wasn't a part of my December budget, but rather a year end or holiday "bonus." I considered using a little extra money to buy bargains in the after holiday sales, I considered buying a new leather purse, but neither of those were speaking to me the way this dress was. Although I don't make purchases like this often (or ever! ), I always feel really guilty spending extra money on myself. To counteract that guilt I try to do something positive for someone else, so this year I made a donation more than double the dress price to local families in need anonymously. I felt completely confident with this purchase, love helping others during the holidays, and loved wearing it on NYE. I can't wait to wear it again later this year!